Help your skin LOOK and FEEL years younger with noticeable results in a couple of days! Join the growing legion of users that have felt the benefits of using JJ Labs Skin Solutions' products! We answer questions within 24 hours and ship the same or next business day so as to provide you with the best customer service!We make all of our products right after they are placed so as to provide you with the FRESHEST and best quality serums!Perfect for giving out as a gift! Our freshly made serums are packaged in a specialblack velvetcasethat's great for everyone! The elegant packaging helps giving our amazing serums perfect for any occasion, including birthdays, holidays, and those special "just because" days. People love how our serums make their skin feel and look years younger, especially with our low prices!We are now offering the option to change your dropper to a pump dispenser or a pump dispenser to a dropper!If no request is noted, we will provide the standard dispenser for the ordered serum.Propolis Anti Oxidant Serum with Ginseng, Witch Hazel, Vitamin C, Winter Cherry, Resveratrol, and Hyaluronic Acidfor all skin typesOurPorpolis Anti Oxidant Serum with Ginseng, Witch Hazel, Vitamin C, Winter Cherry, Resveratrol, and Hyaluronic Acid is formulatedwith the power ofPropolis and Hyaluronic Acid to protectyour skin’s youthful glow, restore skin’s health, and reduce the appearance of wrinkles for a visible increase in facial radiance.1.2oz(30 ml)/ 2.3oz(60 ml)Ingredients benefits:1. Hyaluronic Acid:MoisturizingSince hyaluronic acid holds moisture well--holding up to 1,000 times its weight in water--it is commonly used in moisturizers. It serves to deliver AND hold water to the skin. As a large molecule, it doesn't permeate deep into the skin and stays near the surface to moisturize the skin's surface layers.WrinklesThe loss of natural hyaluronic acid is one of the most common causes of wrinkles, so the idea of putting HA back into the skin to repair wrinkles makes sense. Hyaluronic acid fillers are useful for reducing or removing wrinkles. 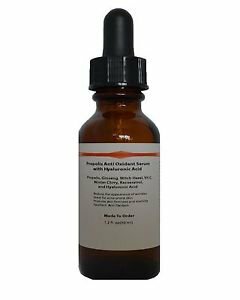 We keep our Hyaluronic Acid PURE and ALL NATURAL to make your skin look younger, smoother and firm.SafetyHyaluronic acid based products are considered extremely safe. There are few allergic reactions or side effects involved with using hyaluronic acid, though some people may experience a mild, temporary redness or swelling after an injection.We keep our product for topical use only so as to reduce the chances of this!ConsiderationsRepeated use of hyaluronic acid will maintain moisture levels in the skin, preventing skin dehydration.2. Propolis:More recently Propolis has been used in a variety of natural skin care products.. Its natural properties make it a unique ingredient for problematic or sensitive skin. It contains over 50 different flavonoids (natural anti-oxidants). It enables skin to remain healthy, clear and beautifulAs the bees natural anti-septic, Propolis has strong preservation properties for skincare products.3. Ginseng:Ginseng is most often included as an anti-aging ingredient in facial moisturizers. Several medical studies have shown its effectiveness in fighting wrinkles due to ginseng's ability to boost skin-firming collagen. The herb also acts as a whitener, giving the skin a brighter and more youthful appearance.Ginseng has been promoted as an anti-ageing treatment. It contains a large amount of phytonutrients, which can stimulate and activate the skin’s metabolism. It also contains certain ingredients that can increase the production of collagen in the middle layer of the skin known as dermis, making your skin firmer. This collagen makes your skin more elastic and toned, thereby diminishing wrinkles or fine lines on the face and other body parts.Another noteworthy benefit of ginseng is that it helps in reducing puffiness of the eyes and lightens under-eye dark circles.4. Witch Hazel:Witch hazel is considered to be a potent astringent due to the high level of tannins in the leaves, according to Drugs.com. The tannins help to tighten skin proteins which then form a protecting covering to help promote skin healing. This property makes it particularly useful for treating skin conditions like eczema, as well as restoring vessel tone in varicose veins and also soothing hemorrhoids. Witch hazel is to treat sunburn and prevent peeling and flaking.5. Vitamin C:AntioxidantVitamin C is a powerful and effective antioxidant that protects our bodies from free radicals that cause oxidative stress. Excessive oxidative stress, or "cellular rust," can lead to many severe medical conditions and is associated with many different types of cancer, including lung, mouth, throat, colon, stomach and esophagus. Vitamin C also helps to regenerate vitamin E (another useful antioxidant).Topical Vitamin C is a powerful antioxidant that can help our damaged skin to recover and can protect it from future damage.- Is more concentrated than nutritional Vitamin C- Is rapidly absorbed so it won't rub or wash off- Allows for greater penetration to the skin for greater benefit- Neutralizes free radical damage- Helps moisturize and increase skin hydration- Stimulates collagen production and restores elasticity- Prevents premature skin aging- Decreases fine lines and wrinkles- Lightens and brightens the skin for a more even skin tone6. Winter Cherry:Winter cherry extract stopped collagen degradation and facilitated collagen stabilization in one study.Since collagens are proteins that make up skin tissue, stabilizing them could prevent skin breakdown.Winter Cherry is a potent antioxidant that detoxifies skin.7. Resveratrol:In nature, resveratrol functions as part of a plant’s defensive arsenal. Resveratrol is an antimicrobial substance produced by plants in response to stress, infection, or strong UV radiation. In recent years, resveratrol in particular has become the subject of intense interest due to its powerful antioxidant and anti-aging properties.It appears that resveratrol exerts its potent antioxidant effects on two distinct levels: (1) by scavenging existing free radicals and (2) by preventing their formation.The antioxidant ability of resveratrol is known to be both potent and efficient. In fact, it has been shown to be greater than that of vitamins E and C. One study demonstrated that resveratrol was 95% efficient at preventing lipid peroxidation, compared to 65% for vitamin E and 37% for vitamin C.Topical application of resveratrol to protect against UVB-mediated skin damage as well as inhibit UVB-induced oxidative stress has been observed in a number of additional studies.It has also been shown to prevent UVA damage and abnormal cellular proliferation.- High concentrations of resveratrol have been collected by herbalists from Japanese knotweed for treatment, as well as many other plants around the world, making it easily available for those who would want to take it.- Additionally, stimulation of this gene is responsible for slowing down the process of aging.- It also helped decrease inflammatory arthritis.- Resveratrol is an antioxidant which acts to slow and stop the oxidation of other cells. Oxidation causes stress and eventually irreparable damage to cells, thus leading to their death. Using substances containing lots of antioxidants in the daily diet or supplementing the diet with antioxidants, will slow down the aging of cells. This, in turn, promotes good health and long life.Directions:Apply twice a day, once in the morning before your normal moisturizing routine and again in the evening to a cleansed face. As the serum is concentrated, using a small amount, such as 1-2 drops, is recommended. Increase amount as desired.Ingredients: Hyaluronic acid, Propolis, Ginseng, Witch Hazel, Vitamin C, Winter Cherry, Resveratrol, Optiphen, Potassium Sorbate, Citric acid, Distilled waterPropolis and Royal jelly are POSSIBLY SAFEwhen taken by mouth or applied to the skin appropriately. It can cause allergic reactions, particularly in people who are allergic to bees or bee products.Check out the video by YouTuber Oxana124 for her thoughts on our serums!